What Can Happen if My A/C Unit Is the Wrong Size? Finding the right size of air conditioning unit for your home or apartment can be much like Goldilocks’ quest to find the right porridge – which size A/C unit is just right? You’ll know your A/C unit is too small for your living space if you notice it is running constantly despite not effectively cooling the area. If the unit is not able to achieve the desired temperature, it will keep running to try to reach it. Having an HVAC unit working 24/7 can seriously drive up your monthly electrical bill while still not providing the necessary comfort for you and your family. Conversely, if your A/C unit is too big for your home, you’ll notice it running in shorter bursts rather than in a more consistent pattern. This means that it can effectively reach the desired temperature in a very short amount of time, which will then alert the machine to turn off. A/C units that frequently turn off and on can also drive up the overall cost of your electric bill and is certainly not the most efficient way to cool your home. A well-sized A/C unit functions in cycles that will cool your home effectively without over-compensating and running your bill up. You will notice a more consistently cool house, without huge deviations in temperature that make you either too hot or too cold. If you track your electric bill across a couple of months, you’ll be able to see if there are any abnormal peaks or dips that might indicate there is an issue, or if everything seems to be consistent. A simple equation can help you estimate the correct tonnage for your home – once you have this figure, call Max Mechanical to see how we can help you install or replace a new A/C unit for you. Based on this equation, a 4-ton A/C unit would probably be the best bet for your home, though you should always consult a professional like Max Mechanical! 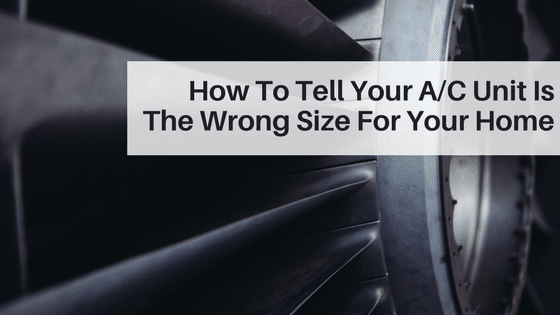 Whether you think your A/C unit is too big or too small, it’s important to check in with a reputable HVAC technician to ensure your conclusion is correct!